Steven (Chicagoland, United States) on 10 June 2010 in People & Portrait and Portfolio. President Roosevelt, with his dog Fala, a Scottish Terrier. 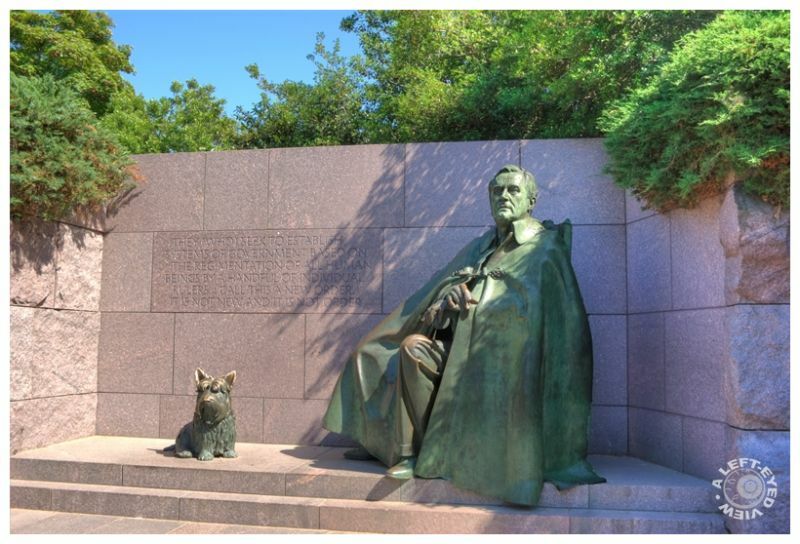 Fala survived President Roosevelt by seven years and was buried alongside him. The quotation in the background was spoken at the address to the Annual Dinner for White House Correspondents' Association, Washington, D.C., on March 15, 1941 and reads, "They (who) seek to establish systems of government based on the regimentation of all human beings by a handful of individual rulers call this a new order. It is not new and it is not order." This was considered a controversial statue of Roosevelt at the time of the memorial's unveiling as he is seen covering his body with a cape and hiding his wheelchair. Roosevelt frequently hid his polio from the general populace because he feared that the country would see him weak and not a good President. An additional statue, not original to this memorial site, was erected at a later date showing President Roosevelt in his hand-made wheelchair. Great light & shade, and I love the quote, it is still so relevant! A very beautiful capture, perfect framing, very good color, Yours sincerely. Awesome shot! Great composition and detail! Color shading perfect! They always say, man resembles his dog :) . I wasn't aware he wore the cloak over the chair like that. Intelligent on his part. So much stigma is assigned to those with health problems as if the rest of them doesn't function if they have a bad arm or something. Think of how brilliant Steven Hawking is. I think in this day an age while he is seen as afflicted, he's not treated that way because he is just so smart and has proven himself. But in FDR's time.. that wasn't always the case. Well described, depicted, processed. @Dutch: Roosevelt actually didn't wear a cape/cloak over himself. It was the artist, George Segal, who decided to drive home the point that Roosevelt hid his disability by incorporating this cape as part of the monument. That angered some people, which is why there was the response that led to the sculpture that was added at a later date and featured this past Monday. Trueman was greatly underrated by historians, your pictures have gone some way towards redressing this balance. He the right man at the right time. A superb photo. Beautiful light and tone. I like it. Have a lovely afternoon Steven. A super photo of this beautiful sculpture. The dog adds a humanistic feeling. How on earth did I mix up Roosevelt and Trueman? I really like your processing... excellent photo.